Look what found it's way into my stash last week! Against all odds and over 1100 other comments, I happened to be the lucky blogger to win this fabulous giveaway at Rita's Red Pepper Quilts. Thanks to Jackie of Canton Village Quilt Works for sponsoring the giveaway. Paperweight and Roman Glass are my all-time favourite Kaffe Fassett prints, so I was very excited when this fat quarter stack arrived! Lucky you, you could always send them to me! I expect you will make something beautiful, I have a few of these and they are some of my favourites too. I saw that you were the winner. How lucky are you! Such beautiful colours. I saw you were the lucky winner too Krista. I think I would just pet it until the right project jumps into your head. Enjoy! wonderful stack of faabrics - you'll have fun creating something sensational, I'm sure! I was so chuffed to see you'd won these, Krista. They're some of my all-time favourite fabrics, period. Have fun!! Wow! You are one lucky lady. Can I rub your head for good luck? You've been on a winning streak lately. You know what they say: What goes around comes around and you are also a very generous lady:-) Congrats! so awesome for you.. I love all of it. Have fun! Congrats! These are some of my favourite Kaffe prints, too. I'm sure you'll come up with a lovely idea or two to make the most of them. Enjoy! Congratulations, I'm so jealous! These prints are beautiful!!!!!!!! Oh send them on, you don't need them! Oh my goodness....what to do with them? I would make a gorgeous appliqued garden, dontcha know with crazy birds and whimsey and fun! I can see it now! Lucky you! Big congrats to you. The fabric is lovely! SCORE!! Now run to nearest Lottery booth!! I love these too...made a quilt last year with paperweights and batiks...yum! Lucky you. I have been looking at my quilting book this morning for ideas on what to make for a couple quilts that I bought material for yesterday. 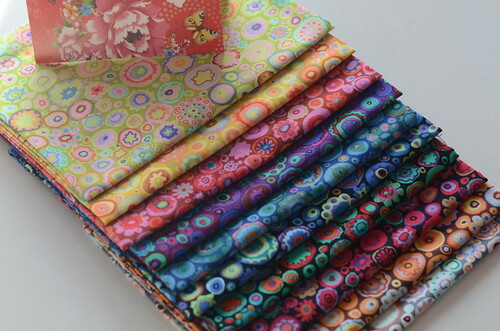 In the 4 patch type I am partial to the paper pinwheel and the indian start patterns? Or you could just ship it over to me lol. I saw that you had won. Congratulations! So exciting. Have fun with those luscious fabrics; I'm sure you'll come up with the perfect project for them. I should say you were lucky.....love love love them!! Sweet!! I'm sure you will think of something fantastical to do with that abundance of loveliness! I love the paperweight and roman glass prints too Krista. How lucky and how nice for you. You are going to create something beautiful with them I am sure. can't wait to see what you do with these!. they are so beautiful. It gives me hope when I see a name that I recognized as a winner. Congrats on wining and looking forward to seeing what you make. Oooo. Lucky you! I'm sure you'll make something fabulous with them. You are so lucky! I adore those gorgeous fabrics. I bet you are gonna make something beautiful out of them! I was just looking at some Kaffe fabrics the other day, and these are some of my all-time favorites of his prints. And congrats on winning them! Sometimes when I see how many comments there are on a giveaway, I don't even leave one. You restore my faith that there is a chance to actually win! I'm sure you will use them to make something fabulous!